A “Beijing Girl” is never at rest. Patches of pigment dance across her face, swelling and bursting from its surface in a buttery lather you could spread for miles. Each swath bends its own band of hues; each meddle makes its own light. Bold strokes volley across the bones, over the flesh, jostling and tossing with each other. Her cheeks and lips are aflame, and her eyes won’t let you go. A “Beijing Girl” is a commotion — of color and texture teeming with life. 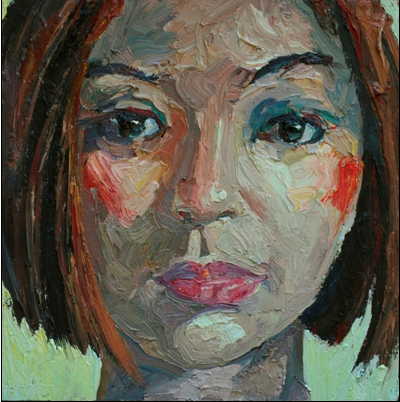 Eleven new “Beijing Girls” are currently on offer at Dawson Cole Fine Art in Laguna Beach, California as exhibited in FRESH STROKES: Recent Paintings by Jian Wang, which also features other portraits and figures along with landscape and still life paintings by this enigmatic and prolific artist. 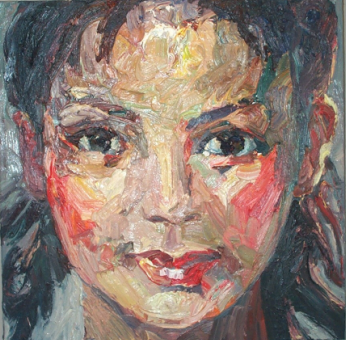 The early “Beijing Girls” appeared in Wang’s 2007-08 series of very large works called New Modern Urban Girls in reference to youths who posed for their portraits when Wang set up his studio in Beijing prior to the Olympics held there last summer. They may be icons of Wang’s personal mythology of China upon his return there after almost twenty years in the U.S., but the sheer number of these luscious oil paintings, the scope and variety of the subjects and their expressions, hints at an objective reality that Wang’s hungry sensibility brings to light. A girl might be embarrassed, distracted, relaxed, restless, or contemplating some long-lost thought, and Wang catches the rush of feeling across her face with the rapid motion of his brush. “These girls working in the service sector,” Wang explained at the Dawson Cole Fine Art gallery, “along with men working in construction, have made China the prolific nation it is today, with its skyscrapers and highways. They can build a Buick there now (and a Mercedes and a BMW!) — but it’s in the girls that the changes show the most for me. I call my paintings a glimpse of intimacy of the new China, and it goes far further toward democracy than guns and bullets and military repression. The girls are from all over China, but all from the countryside, and they all come to Beijing. “Each of my paintings is 90% experiment and 10% experience. Because of this, it doesn’t work every time,” Wang told those of us attending Dawson Cole Fine Arts’ opening reception for Fresh Strokes in Laguna Beach on a balmy night this summer. Wang considers his approach both emotional and physical. “I usually use only three brushes, big ones — house and furniture painting brushes, one to two inches wide, because I use the sides, too, depending on how I twist the brush. I begin with just eight colors, combining them right on the canvas. This is intuitive. I’m careful with my gestures. As I work, many colors begin to infuse each stroke. They are never completely mixed, so they are quite alive.” It’s this technique, and not the rich oil of the paint that seems never to dry, that creates an unforgettable radiance in the paintings. Their light is that dynamic play of color in each stroke, all but sculpted on the canvas, casting shadows in its depth. Responding to the Expressionists in the San Francisco Bay area (Manuel Neri, Richard Diebenkorn, Joan Brown, Elmer Bischoff), Wang further side-steps the use of sketches, base colors, and palettes, adapting the “premier coup” or alla-prima (“first stroke”) approach to apply raw color with fast and forceful brushwork that reveals its speed and dynamism on the canvas. The pigment is not layered but stacked, allowing Wang to carve into the thick and heavy impasto the lines that give birth to a shape, or the strokes that reflect light. There he weaves his colors, his crisscrossing movement of the brush, his rising and falling textures. The painting is never “finished”; rather, it is an ongoing enactment of the creative process. And that process continues in the eye of the beholder. The noticeable fact that all of these painterly values fluctuate as the point of view shifts on the “Beijing Girls” only accentuates their liveliness. Viewed in detail, their abstraction increases as lathery swirls pulse with color contrasts beside jagged mounds of paint. Yet at a distance the faces become starkly real, fusing color and form into a singular expression with radiant emotion. Regardless of the monumental size of most “Beijing Girls,” they cast an intimate lure to the spectator via a charm that transpires within the paintings and emanates from them with the change of perspective. As “close-ups,” their composition catches us peering at them, until we become self-conscious of our point of view as the faces look back. The paintings, in and of themselves, are about looking — not only about how we gaze with curiosity at these youthful protégés of China’s globalization, but also about how they look at us — their very process of registering and taking in a new and vastly different world, changing by the moment, that they might make their own. The speed at which they do this today is reflected in the artist’s process in creating their images. That self-reflexivity within the painting as an artistic medium possesses Wang himself, who in 2006, just prior to his return to Beijing, commented to Jessie Qu (in Jian Wang: The Legend of a Chinese Artist in the United States), “I found that Minimalism relies heavily on the deletion of reality, and it bears a close relation to our time. Gradually its pure nature infused a sense of loss and a feeling of desire in me.” That sense of loss and desire took Jian Wang home to China, but it also set him looking at his own footprints. Having mastered both poster-style realism (he was luckily recruited to paint placards as a youth during his “re-education” amidst China’s Cultural Revolution) and also traditional Chinese calligraphy (he managed to teach it to an association of college students at Dalian Railway Institute where he studied and taught engineering), Wang wanted to leave these behind when he moved to the U.S. in 1986. His goal was to continue his private childhood investigations of Michelangelo and Rembrandt and become well versed in various languages of European oil painting — Impressionism, Abstract Expressionism, and Minimalism. As he studied and practiced these near America’s west coast, he also discovered the regional idioms of California painting such as the Bay Area Figurative School and the Sacramento School. Thoroughly “Westernized” in any sense of the word, he readily found his place among mentors and colleagues, curators and critics, and the viewing and buying public at galleries. Based in Sacramento for twenty years and studying there as well as at UC Davis (he earned a Bachelor’s and a Master’s in Art), he painted hundreds of striking landscapes of the American River across the seasons and times of day as well as full-figure nudes and still life works, many of watermelons. With his bright and massive colors, he was painting directly opposite his subject, like his Bay Area peers; and like his predecessors in the Sacramento School, with his pronounced strokes of thick paint he was adhering to the subject without entirely abstracting it. Yet unlike Lucian Freud, who was inspiring artists such as Liu Xiaodong of the New Generation School in China with his massive texture, Jian Wang’s build-up of paint was not achieved by repeated layering. “Your colors and brush strokes are too stiff… Be brave — animate your paintings,” Wayne Thiebaud, his mentor at the University of California Davis, had taught him. And there was something else. Perhaps it was Thiebaud’s still life paintings of pastries that first inspired Wang to return to China and paint his Beijing Fruit Cakes in 2006, their translucent jellies lit with delectable life and their forms casting strong, bold shadows. Expressionistic in his application of pigments and Impressionistic in his segmentation and juxtaposition of colors, Jian Wang intuitively shifts the outlines of his forms with the swift motion of his brush. With the long and short, free and fluid, but vigorous and precise strokes of a calligrapher, he captures the mettle of his female subjects, an exterior/interior coming into being. Girls from the countryside whose cheeks bear the mark of sleeping over warm bricks — girls in uniform who personalize their looks by painting their own cheeks with rouge — they are girls in motion, making the moves themselves. Consciously or not, Wang’s pronounced use of red evokes the traditional values of Chinese culture: red for joy, for passion, for life. In her article on a film by China’s world-lauded director, Zhang Yimou, “Not One Less: The Fable of a Migration,” Rey Chow discusses how we look at Wei, a teenage girl recruited as a teacher in the impoverished Shuiquan Village of northern China, as she travels to a nearby big city to look for one of her students who fled there for work to help his sick mother. Rey Chow proposes that our way of looking at Wei is not transparent, that simply seeing her doesn’t allow us to understand who she is, what she thinks, or how she feels, as we might suppose. In fact, Chow claims, “Sight… is a surveillance mechanism installed on (other) human beings…” yet what we see might not be what we get. Furthermore, there might be a better way of looking than from the mere angle of information retrieval for the “factographic value” of an image. Does this mean that who he paints is insignificant? Not at all. But it means that we might look at his painted subjects with the same eyes with which we gaze at his self-portraits. Not all of our questions will be the same, but they might overlap. And when we ask why he paints the way he does (considering his thousand canvases sold already and up to fifty “Beijing Girls”), we might discover a new way of seeing. Images are not illustrations, nor interpretations of a narrative such as migration or globalization, much less answers or explanations. Wang’s dynamic response to contemporary life takes shape in the semiotic movement traceable in his handling of visuality. He enters into a dialogue with the shifting cultural identities of his subjects through the lens of his own fluctuating cultural experience as an artist with ever-evolving modes of expression.